UNITED NATIONS (AP) — Experts from the U.N. and the chemical weapons watchdog are blaming Syria’s government for a sarin nerve gas attack that killed over 90 people last April. Syria and Russia, its close ally, have denied any attack and have strongly criticized the Joint Investigative Mechanism, known as the JIM, which was established by the U.N. and the Organization for the Prohibition of Chemical Weapons to determine responsibility for chemical weapons attacks in Syria. 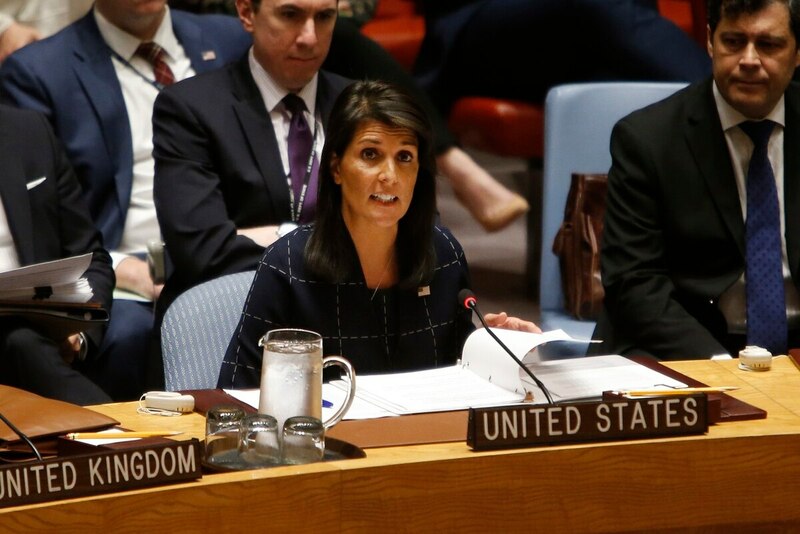 The Security Council should make it clear that “the use of chemical weapons by anyone will not be tolerated,” Haley said. A fact-finding mission by the Organization for the Prohibition of Chemical Weapons reported June 30 that sarin was used in the Khan Sheikhoun attack and “sulfur mustard” in Um Hosh. But the JIM experts had the task of determining who conducted the attacks. The JIM experts said Thursday they are “confident” the Islamic State extremist group was responsible for an attack in Um Hosh in Aleppo on Sept. 15-16, 2016, that used “sulfur mustard,” the chemical weapon commonly known as mustard gas. The report was issued two days after Russia vetoed a U.S.-sponsored resolution to extend the mandate of the JIM investigators for another year after it expires Nov. 17. Russian Ambassador Vassily Nebenzia said Moscow wanted to wait for the JIM report. “We can meaningfully negotiate the renewal of JIM after we have seen the report,” he told reporters Thursday before it came out. Russia’s U.N. mission had no immediate comment on the report. The investigators determined last year that the Syrian government was behind at least three attacks involving chlorine gas and that the Islamic State extremist group was responsible for at least one involving mustard gas. The report said the JIM experts talked with 17 witnesses in addition to those interviewed by the OPCW fact-finding mission and collected and reviewed material the OPCW did not have. It said the experts also obtained “substantial information” on activities by the Syrian air force on April 4. Based on photos, videos and satellite images as well as studies of munition remnants by forensic institutes and individual experts hired by the JIM, the experts “assessed that the crater was most probably caused by a heavy object traveling at a high velocity, such as an aerial bomb with a small explosive charge,” the report said. The report said the investigators received information that Syrian air force planes “may have been in a position to launch aerial bombs in the vicinity” of the town. But it said air force flight records and other records provided by Syria’s government made no mention of Khan Sheikhoun. The experts said they received “conflicting information” about aircraft deployments in the town that morning. The experts also obtained “original video footage from two separate witnesses that showed four plumes caused by explosives across Khan Sheikhoun,” the report said. It said forensic analysis confirmed the footage was made during the time of the sarin attack. —Syrian aircraft were “in the immediate vicinity” at that time. —The crater was created that morning.